During the late eighties the afrocentric movement was fully on the rise in hip-hop. Groups like Public Enemy, Boogie Down Productions, and the Jungle Brothers rocked African medallions and spat rhymes full of black pride, provoking a new consciousness in hip-hop. X-Clan would also walk this path as well. X-Clan was made up of chief emcee Brother J, The overseer Professor X, and Sugar Shaft the Rhythm Provider (aka crew deejay), and according to Wikipedia, Paradise the Architect, who honestly I’m sure what his role was in the group, but this must be true since that would account for the 4 brothers on the front and back of the cd insert. 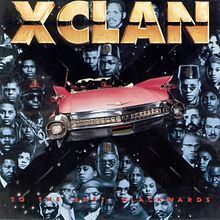 X-Clan released their debut albumTo the East, Blackwards which would mix funk loops with heavy afrocentric lyricism. It was received with heavy critical acclaim and is also included on The Source’s top 100 hip-hop albums of all-time. Sadly, Sugar Shaft would die of complications of AIDS in 1995 and Professor X would die from complications of spinal meningitis in 96′. RIP to both of them. Funkin Lesson – After Professor X provides his signature seal of approval, Brother J goes to work like an architect over this Parliament sampled instrumental, and builds a beautiful mansion. “Atomic Dog” and “One Nation” aren’t original sample sources but listening to X-Clan’s use of them sounds surprisingly refreshing. Nice way to start the album. Grand Verbalizer, What Time Is It? – Brother J goes right back to work, using the same sample from Eric B & Rakim’s “Microphone Fiend”, and rips the heart out of it, all while supplying a Black History lesson for the listener. It sounds like Brother J takes a few shots at KRS-One/BDP, and I vaguely remember hearing of some beef between the two “conscious” crews. Regardless, this was hot. Tribal Jam – This head nodding instrumental fits the title perfectly. Brother J delivers another solid performance dropping lines about his norm: white devils, cavemen, black power. This sounds a lot better today then I originally remember. A Day Of Outrage, Operation Snatchback – Brother J proves that he can snap on any style of beat as he completely demolishes this rock tinged instrumental, and adds 3rd Bass to their list of nemesis as Brother J takes a shot at the melanin challenged emcees. I think it’s safe to say Brother J doesn’t have any white friends, or like white people to that point: which is ironic considering whites were probably responsible for the majority of the album sales. Verbal Milk – Warning: the bass line on this one is addictive. I love the song title but I wouldn’t consider Brother J’s verbals to be milk as they pack way more substance. 100% beef, baby. By the way: where does Professor X come up with the babbling he does at the end of these song? It’s entertaining, though. Earth Bound – I’ve never liked any song that has used the Parliament sample used on this song, and this is no exception. Lyrically Brother J sound solid, but he sounds very uncomfortable rapping over this instrumental. Oh well, no one’s perfect. Shaft’s Big Score – Resident DJ, Sugar Shaft gets a chance to display his ability on the wheels of steels over a tribal sounding track. Of course, no X-Clan track would be complete without an interruption from clan leader Professor X and his babble. Those of you who read this blog on a regular basis already know how I feel about these types of songs. It doesn’t help that it plays on nearly two minutes longer than it has any right to. Raise The Flag – X-Clan completely changes the pace with this semi-jazz tinged instrumental that Brother J rides like a saddled horse. Brother J uses this one as a call for Black unity and the results are vanglorious! Heed The Word Of The Brother – I belief this was the first single off the album, or at least the first song I remember hearing from X-Clan. The instrumental samples from Zapp’s “More Bounce To The Ounce” and Brother J rips it to pieces (as usual) while on his soapbox. Professor X’s request for Aristotle, Plato, and Socrates to “step off” is still hi-larious. Nice. Verbs Of Power – After Professor X spend the 1st minute with his random chatter and reminding you who “this is protected by”, Brother J takes you to chuch over a heavy bass line and organ sample. Amen, brother, amen. In The Ways Of The Scales – In between dropping jewels Brother J takes another shot at 3rd Bass, but this shot is an eye jammy. The instrumental samples from a hip-hop artist favorite source material. This was a pleasant way to close out To the East, Blackwards . To the East, Blackwards is a very solid debut. Brother J proves himself to be a more than capable emcee and the production pretty much bangs from beginning to end. My only quarrel with To the East, Blackwards is the subject matter, as it never leaves the black militant stance and you could literally switch the lyrics to any of the other songs and it would fit perfectly. That said, Brother J has a lot to say and delivers it cleverly and will have you rewinding some of the songs several times to fully chew and digest his meat (lyrical meat that is). This is protected by the red, the black, and the green, with a key….sissy’s.